These aim to standardize and harmonize the existing Supply Chain Finance market terminology to make it operational and usable in daily practice by banks and non-banks when processing, financing and mitigating risk in trade transactions. 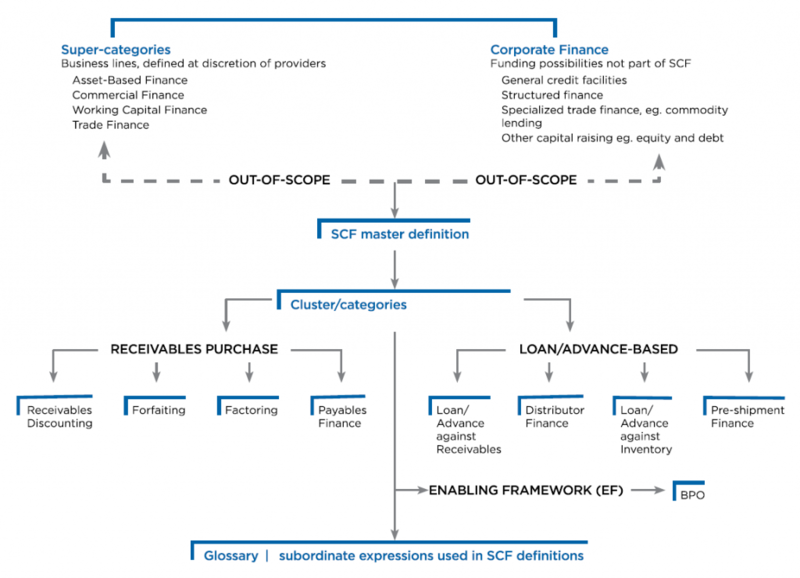 Supply Chain Finance (SCF) is the use of financing and risk mitigation practices and techniques to optimize the management of the working capital and liquidity invested in supply chain processes and transactions. Visibility of underlying trade flows by the finance provider(s) is a necessary component of such financing arrangements which can be enabled by a technology platform. We aim to ensure a much clearer communication in this rather complex ecosystem of providers, clients, accounting and legal professionals, regulatory authorities and others involved in international supply chains. World trade volumes have seen a startling increase in open account transaction over the recent years. Already today more than 80 % of the total world trade volume (export) is settled by clean payment. This impressive ratio is expected to grow even further in the future. As a consequence banks are compelled to offer their corporate clients products that support fully automated processing as well as cost savings combined with payment assurance and financing options. The graphic reflects the relative slow growth of traditional trade finance as against the exponential growth in open account trade activity, particularly in the last decade. The terminology will greatly enhance the ability of clients to understand, compare and select optimal solutions to their supply chain finance needs and consider the offerings as an attractive alternative to other financing models. Clients will be able to weigh alternatives, their advantages and disadvantages, and engage in a clearer and more relevant dialogue with finance providers and other supporting communities. Download a PDF version of the terminology in English or Chinese language. SCF is a portfolio of financing and risk mitigation techniques and practices that support the trade and financial flows along end-to-end business supply and distribution chains, domestically as well as internationally. This is emphatically a ‘holistic’ concept that includes a broad range of established and evolving techniques for the provision of finance and the management of risk. SCF is usually, but not exclusively, applied to open account trade. Open account trade refers to trade transactions between a seller and a buyer where transactions are not supported by any banking or documentary trade instrument issued on behalf of the buyer or seller. The buyer is directly responsible for meeting the payment obligation in relation to the underlying transaction. Where trading parties supply and buy goods and services on the basis of open account terms an invoice is usually raised and the buyer pays within an agreed time frame. Open account terms can be contrasted with trading on the basis of cash in advance, or trading utilising instruments such as Documentary Credits, as a means of securing payment. Parties to SCF transactions consist of buyers and sellers, which are trading and collaborating with each other along the supply chain. As required, these parties work with finance providers to raise finance using various SCF techniques and other forms of finance. The parties, and especially ‘anchor’ parties on account of their commercial and financial strength, often have objectives to improve supply chain stability, liquidity, financial performance, risk management, and balance sheet efficiency. Finance providers offer their services in the context of the financial requirements triggered by purchase orders, invoices, receivables, other claims, and related pre-shipment and post-shipment processes along the supply chain. Consequently, SCF is largely ‘event-driven’. Each intervention (finance, risk mitigation or payment) in the financial supply chain is driven by an event or ‘trigger’ in the physical supply chain. The development of advanced technologies and procedures to track and control events in the physical supply chain creates opportunities to automate the initiation of SCF interventions in the related financial supply chain. SCF is not a static concept but is an evolving set of practices using or combining a variety of techniques; some of these are mature and others are new or ‘leading edge’ techniques or variants of established techniques, and may also include the use of traditional trade finance. The techniques are often used in combination with each other and with other financial and physical supply chain services. Supply Chain Finance is defined as the use of financing and risk mitigation practices and techniques to optimise the management of the working capital and liquidity invested in supply chain processes and transactions. 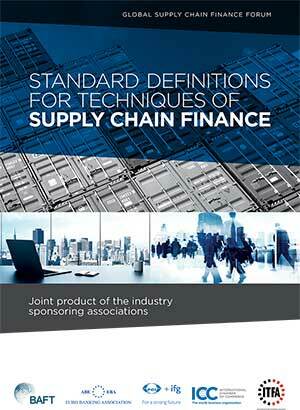 SCF is typically applied to open account trade and is triggered by supply chain events. Visibility of underlying trade flows by the finance provider(s) is a necessary component of such financing arrangements which can be enabled by a technology platform.